Electronics Manufacturing Services (EMS) Market size is set to exceed USD 650 billion by 2024; according to a new research report by Global Market Insights, Inc. The rapid rise in the demand for consumer and smart electronic devices across the globe is driving the EMS market growth. Increasing demand for devices, such as smartphones and tablets, accounts for the development of new collaborations and partnerships between service providers and OEMs. As a result, EMS market players deploy efficient manufacturing machines and service delivery facilities that further fuel the industry development. The demand for efficient & safe smart devices from manufacturers allows service providers to improvise their technical capabilities. Additionally, increasing investments in outsourcing activities by OEMs for availing the logistics, manufacturing, and testing services add up to the consumption of the products. The demand for green and energy-efficient devices & components that creates a need for these services further contributes to the electronics manufacturing services market growth. To cater to these demands, OEMs are developing strategic partnerships with the service providers that aids them in controlling manufacturing costs. The service providers offer product design, development, and manufacturing operations according to the demand from OEMs. Due to these facilities, OEMs achieve appropriate product supplies and save major development costs. This trend allows the EMS market players to develop green manufacturing facilities and energy-efficient products that support the global sustainable goals. 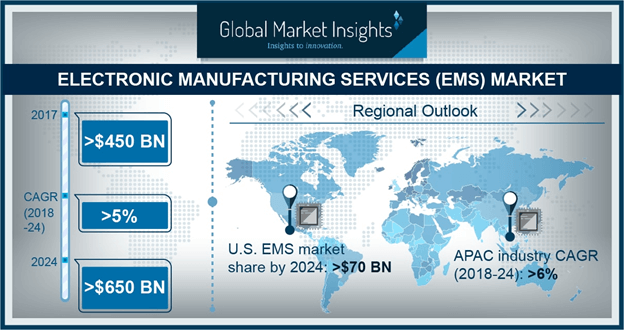 EMS market will be driven by the electronic manufacturing, which is expected to exceed 55% of the revenue share due to the continuous demand for electronic components in various industry verticals such as automotive, consumer electronics, and others. The products include manufacturing of printed circuit boards, microelectronics, optoelectronics, and radio frequency & wireless devices for the electronics, medical, and telecommunication applications. The growing concerns regarding the production of technically and legally compliant products by the OEMs enforce them to utilize these products on a larger scale. This is attributed to the efficiency, high-quality, and application-specific products offered by the service providers. Moreover, these providers also offer services based on the low to high quantity of product demand from OEMs. Automotive electronics manufacturing services market will grow at a CAGR of around 5% in the coming years owing to the penetration of electronic devices and components in vehicular systems. Increasing utilization of automotive electronics including electronic systems, sensors, and ECUs in the safety, comfort, and infotainment devices creates a demand for EMS. Auto manufacturers develop contracts with the EMS providers for a continual supply of the electronic components. EMS market players have developed specialized design, manufacture, and diagnostic services for the automotive companies. For instance, Actia Group offers automotive industry-specific services to its vehicle manufacturing customers by supporting the production standards such as ISO TS 16949. The U.S. electronics manufacturing services (EMS) market dominates the global industry; the electronic manufacturing services demand in the country is estimated to exceed USD 70 billion by 2024. The emergence of several manufacturing companies across all industry verticals in the U.S. has increased competition and enforced OEMs to partner with the EMS providers. Additionally, increasing government rules to produce safe and tested electronic products to be used in industrial applications, such as medical devices and automobiles, supports EMS market growth. To save the labor costs involved in manufacturing and logistics operations, OEMs in the U.S. are shifting toward electronics contract services. These factors coupled with the growth in outsourcing activities account for the rapid development in the industry. The key companies operating in the EMS market include Flex Ltd., Kimball International, Foxconn, Celestica, Inc., Benchmark Electronics, Actia Group, Key Tronic EMS, Asteelflash, Venture Corporation, and Sanmina Corporation. These players focus on developing highly efficient service delivery capabilities. They innovate the products manufacturing and testing & development services to sustain in the highly competitive electronics manufacturing services market. The established players have an advantage of long-term customer contracts and focus on partnership and acquisition strategies. For instance, in February 2017, Flex announced its acquisition over AGM automotive, an interior component supplier for automobiles. The acquisition aids Flex to achieve efficient design capabilities from AGM and cater to the major global OEMs.